The primary purpose of this website is to serve as a platform for ideas regarding long-distance ice skating on the old, stillwater transportation canals in the state of Illinois. Besides a discussion of a canal skating adventure, there are facts and data about the Hennepin Canal (and to a lesser extent the I&M Canal) including a photo survey and links for more information; there is also a section on bicycling the towpath trails. This website also has sections on natural ice skating and speed skating. Finally, the blog ranges into further topics in related areas such as speed skating, cross-country skiing, and cycling. Illinoistocht? At this time, a formal organized skating event or a long-distance race is more of a dream than a reality. In lieu of an organized event that would require a vast network of volunteers, a small group of like-minded people is contemplating an informal skating excursion over the canals. If you have an interest or comment the contact form is below. In northwestern Illinois there is a canal system with two canals, the Hennepin and the Illinois and Michigan. The Hennepin canal is a few hours drive from Chicago and begins near the Mississippi river in the Quad Cities area (Rock Island, Moline, IL are the Illinois pair, while Davenport and Bettendorf are the pair in the state of Iowa) and continues to its junction with the Illinois river near Bureau, IL. The Illinois and Michigan originates near LaSalle, IL and continues east to Joliet, IL, which is very near Chicago. While the Illinois and Michigan canal only has water in certain areas, the Hennepin is waterered throughout. The best part? Northern Illinois typically gets cold enough every winter for the canal to freeze solid. From looking at maps it would seem possible to skate the Hennepin--but see the "Facts" page as there are also other challenges that compromise a skating marathon or a tour skate. 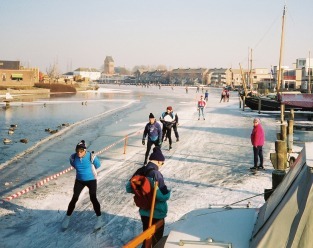 Canal skating in the Friesland province of the Netherlands. At left, skaters prepare to stop at a checkpoint to have their cards stamped. At right, skaters "klune", or portage, around a section of waterway with insufficient ice by walking an overland detour over carpet remnants and plywood laid out to protect their blade edges. It is also very difficult to obtain a start for the Elfstedentocht as there is a lottery system for the available slots. There are alternative tours held (the official Alternative Elfstedentocht in Austria, and some years 200km tours in Canada, Finland, and Japan), but not in the USA. The distance of the Hennepin canal, if you start in Colona at the Rock River junction, and take the feeder loop up and back to Rock Falls, and then continue to the Illinois River in Bureau, is nearly 200km (as you doubled back on the feeder canal). There are other famous canals in North America for skating. The most notable is the Rideau Canal in Canada, of which the 8 km (appx. 5 miles) at the end in Ottawa is cleared and maintained for Winterlude every year. The entire canal itself is just over 200 km, nearly all of which utilizes natural waters such as rivers and lakes. In the US, the Erie system is the furthest north of the major canals, however, due to winter maintenance, much of the length isn't skateable in winter as water is taken down to maintain the canal and the locks. The Hennepin, by contrast, sits ready to be skated--but with many challenges (see the other tabs on this website). Of course there are always safety issues and EXTREME CAUTION SHOULD ALWAYS be employed when skating on natural ice. 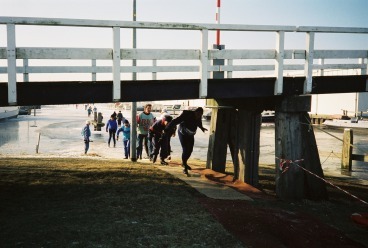 (Note that the weekend after the pictures above of Friesland were taken in early 1996, a few days later, four people perished in accidents involving natural ice--as I recall these were on a large body of water, the Isselmeer, rather than the narrow, shallow canals.) Any skate of the Illinois canals MUST take numerous safety precautions, one of which is a buddy system (hence my creation of this website looking for like-minded people and support crews). Ice conditions can change from one area to the another, and any skate on natural ice needs to have the proper safety equipment and the skaters need to follow the many necessary safety procedures. Have any thoughts? The contact form is below. Map showing canal area. The Hennepin Canal and the I&M cover much of the distance from Davenport, IA to Chicago, IL.